September 10, 2018 at 2:12 am. 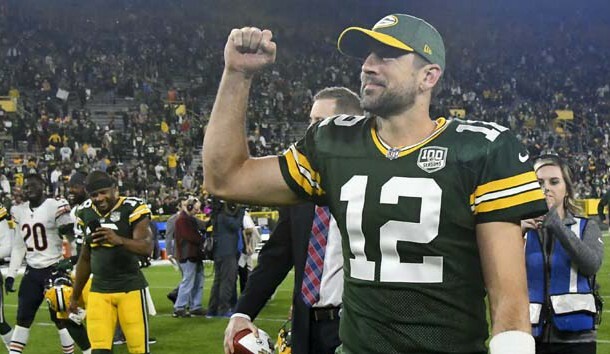 GREEN BAY, Wis. — Aaron Rodgers rose from the turf and the Green Bay Packers rose from the dead. Rodgers, who was carted to the locker room in the second quarter with an injured left knee, returned for the second half and rallied the Packers from a 20-0 deficit to stun the Chicago Bears 24-23 on Sunday night. Rodgers, who was injured when defensive tackle Roy Robertson-Harris fell on him with about nine minutes to go in the second quarter, was simply sensational. He was just 3-for-7 for 13 yards before the injury. During the second half, he was 17-of-23 for 273 yards with three touchdowns and zero interceptions. His second-half passer rating was a perfect 158.3 until he chucked a pass deep into the Green Bay night to burn off the final seconds. First, Mason Crosby hit a 42-yard field goal. Then, a minute into the fourth quarter, Rodgers threw a perfect deep ball to receiver Geronimo Allison, who used a subtle push-off on top cornerback Kyle Fuller to haul in a 39-yard touchdown pass. Less than 5 minutes later, Rodgers threw a quick pass to Davante Adams, which the receiver turned into a 9-yard touchdown to bring Green Bay within 20-17 with 9:01 to play. After back-to-back three-and-out possessions, the Bears’ offense finally got going. A 14-play drive that devoured six-and-a-half minutes off the clock resulted in a 32-yard field goal by Cody Parkey to make it 23-17 with 2:39 remaining. Green Bay is playing its 100th season and for the first time, it rallied from a deficit of 17-plus points in the fourth quarter. The Bears dominated the first half. Quarterback Mitchell Trubisky’s 2-yard touchdown on their opening possession gave it a 7-0 lead. Then, it was the Khalil Mack show. After Rodgers exited, Mack had a sack-strip of backup quarterback DeShone Kizer. On the next possession, Robertson-Harris blew up a screen, which Mack intercepted and returned 27 yards for a touchdown.